I’ve been called as the camp director for our ward this year. The theme is nautical, and our ward was assigned the group of Latter Day Pioneers in conjunction with our overall theme of “Anchor Your Soul in Christ”. 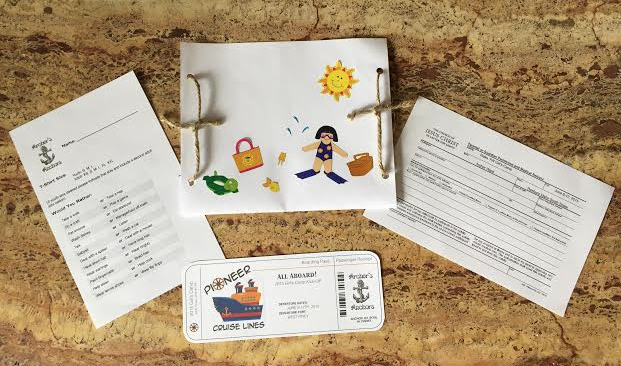 So we’re going on a cruise via “Pioneer Cruise Lines”. Can I just say how grateful I am for new and better software? I’m sorely missing my old photo/image editing and creating software that just got too outdated to work within the new operating systems for computers now. But what a happy thing to be able to do much of the same things with my Mac and its word processing software. Apple rocks! Plus it only took a matter of minutes to generate an anchor logo and a cruise ship image with our name. This week we had our camp kick off with the girls to introduce the theme, share and gather basic information. While I forgot to get any pictures from the event, I do have some of what we did to share. 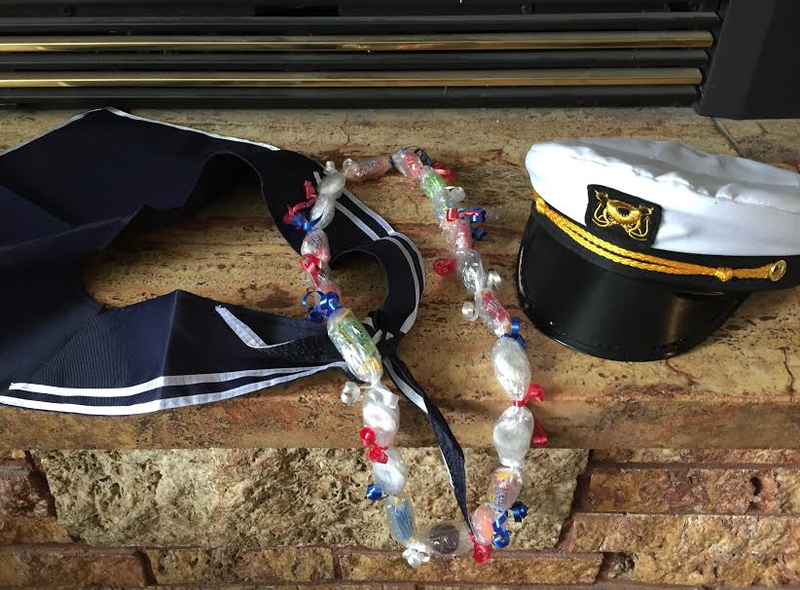 I got captain hats for myself and my assistant director and a little sailor scarf and cap for my junior assistant leader. They were super cheap and really added a little punch to the event. I had our junior assistant help me make candy lei’s to welcome our guests and she handed them out as people arrived. These turned out great but I wish I’d started them earlier. They take quite a bit of time to assemble and we ran out of time to do more than 20 which was just enough for the girls. I’d loved to have enough for the parents and leaders that came too. For reference, it took us about 2-3 hours to assemble 20 leis. I put curling ribbon between each piece of candy (you could do less to reduce time and supplies), and 3 bags (aprox 100 pieces each) of lifesavers and jolly ranchers did 13 leis. If you’ve never done these before, it’s simply candy rolled in long sections of saran wrap and tied off with ribbon. My assistant director took care of the snacks and craft and did an awesome job. We had blue 7-up, red velvet cupcakes, cookie bars, licorice knots, sweedish fish, gold fish and a fun veggie tray with a decorative crab made from a red bell pepper. We tiered stacks of hymn books under our plastic table cloth to add variety to the presentation of the food and that worked great! So if you’re ever in a pinch and want to make things look cool without packing around extra items like cupcake holders, etc. I strongly suggest using hymn books under the table cloth! I wish I’d captured some pictures because the display was really cute. My contribution to the evening was decoration elements and printed materials. I don’t like spending any money on things like decorations because they usually just end up in the trash. So I recycled some shipping materials that were just going to be thrown away – basic cardboard boxes and those new bubble cells they use in place of peanuts now. My goal was cheap, light and weather resistant. Mission accomplished! 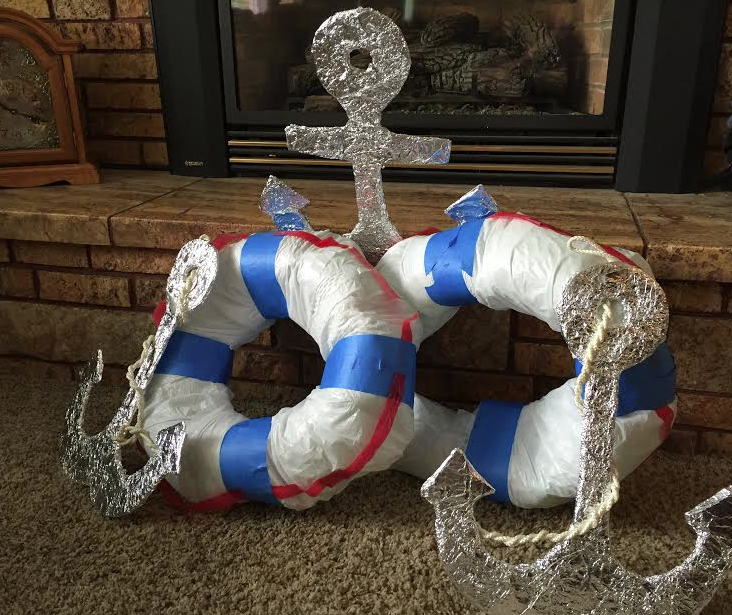 I cut out anchors from the cardboard and wrapped them in foil. 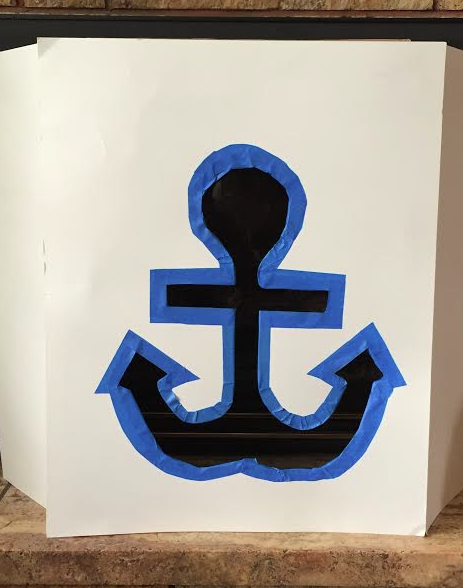 This brought on a really fun idea when I saw one box with the anchor cut out. I could instantly see a photo prop as well as visual for our theme. I ordered the large poster of Christ from the distribution center (very inexpensive!) and the box in came in was perfect to create the visual! I taped a white poster board over the front, and two additional pieces on the side to stretch it out as a large table top display. Then I taped the picture of the savior on the inside of one of the side panels. 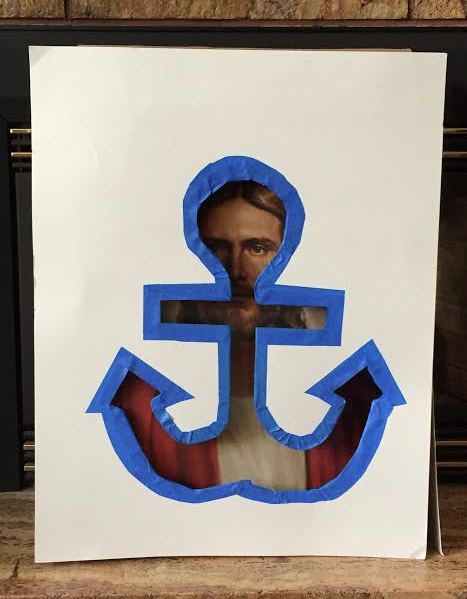 When I was introducing our theme I picked up the display and flipped the side panel in to reveal how Christ should be our anchor. It worked great! We’ll take it to camp and use it as a photo prop too. I took the bubble strands and taped them together to form circles, then wrapped white garbage bags around them, and taped the red pull string around the outside with blue painters tape. Voila! Because they’re light and weather resistant we’ll be able to reuse these at our camp too. 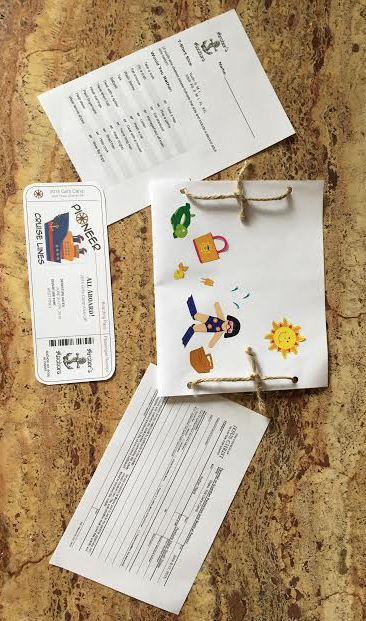 I created and printed some boarding passes as invitations. These turned out so cute! Then I generated a simple questionnaire to get information like T-Shirt sizes and learn a little bit about our girls. I did a “Would you rather” section of questions with things like: Take a walk or Take a nap, Paint fingernails or Braid hair, etc. I also included a medical release form. I wanted to put the information together in a packet so I folded some 8×14 paper, punched holes in the sides and used jute cord to tie them together. I had my junior assistant help me decorate the fronts with stickers. We spent the first half hour explaining the theme and sharing camp information. We had the girls fill out their questionnaires and release forms, got signatures and then invited parents to stay or leave at their discretion. We spent the rest of the activity working on anchor bracelets/anklets with anchor charms and cording. The girls loved these. It’s always fun to see personalities shine through with stuff like this. It was a fun evening and we received lots of happy comments about it. Just eight more weeks and we’ll be camping.